Rory Gallagher’s music reached a massive audience from Norway to Spain, from Japan to the USA, covering all parts of the globe and producing some of the greatest rock/blues albums of the 60s, 70s, and 80s. Sadly, we lost Rory on June 14th, 1995. To his devoted fans and followers this was the ultimate tragedy. 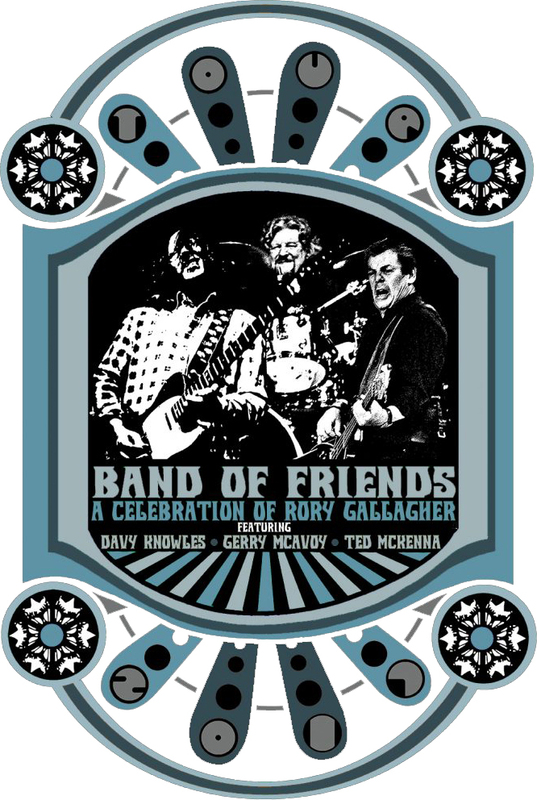 The Band of Friends is not a tribute to Rory, but a celebration of his life and music. The band consists of musicians who played with Rory as his rhythm section for years and is fronted by the incomparable Davy Knowles! Gerry McAvoy (Bass Guitar) played with Rory for 20 years, from 1971 to 1991 and, because of this, has a great insight into the man and his music. Gerry played on every album Rory ever made and wrote a book about his career, published in 2005, called Riding Shotgun. The book was also published in Germany, where it was titled On The Road. Gerry is also known for his time spent with Champion Jack Dupree, Deep Joy, and Nine Below Zero. Davy Knowles is a blues rocker originally from the Isle Of Man and currently resides in Chicago, IL. He is best known for fronting his own band, the Davy Knowles Band as well as being the frontman for the popular blues rock band, Back Door Slam. Knowles’ musical influences include Robert Johnson, Dire Straits, Rory Gallagher, Peter Green, and Eric Clapton to name a few. He has toured alongside the likes of Jeff Beck, Joe Satriani, Chickenfoot, The Rhythm Devils, and Gov’t Mule. Mike Hansen will be replacing the late Ted McKenna on drums. Mike has shared the stage with a fantastic roster of musicians, and we know he’ll do both Rory and Ted proud. Make NO mistake, this is NO tribute band. This is THE RORY GALLAGHER BAND. The BAND OF FRIENDS is a force to be reckoned with.